After Christmas I took the train to Cracow to spend a couple of days on my own just seeing the sights and relaxing. The only time I had been there before had been with my short term mission team in 2003 when we spent an afternoon seeing as much as we could see in a brief time. This time I was able to spend some time getting my bearings, familiarizing myself at least with the old town and some of the historic sites, such as Wawel Castle. I just missed the Christmas market which they hold in the centre square, but that was ok as the 'Cloth market' was open anyway and there were plenty of shops to browse in. My hotel was just 5 minutes' walk from the train station and the historic town centre was also about 5 minutes' walk, so it was very handy to be able to see the town. On the first evening I just strolled around a bit but the next morning I did some serious tourist sight-seeing. I had read a guide book in the hotel that told me about some interesting architecture by a guy named Teodor Talowski so I went in search of the houses they mentioned. One had an interesting inscription that I liked, which means 'Hurry slowly' and another had a character of a frog as the building had originally been by a part of the river where the frogs would sing at night. Another house had a donkey's head on it for some random reason - all very interesting but a bit off the beaten track. I looked in the big St. Mary's Cathedral on the centre square and I also was able to go and see the exhibition of the elaborate nativity scenes created for the annual contest. 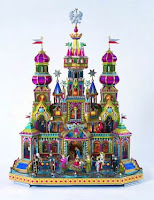 "Every year since 1943, Krakow's Museum of History has celebrated Christmas with a competition for the most beautiful szopka (nativity scene or crib). All the cribs remain on display until early February. These are no ordinary cribs, just depicting Mary and Joseph in the stable with animals, shepherds and wise men coming to greet the baby Jesus. Krakow szopka are highly elaborate, depicting multi-storey buildings topped with church towers, although all with a focal point of the stable and the blessed child.The tradition is centuries old, and now has renewed meaning in the aftermath of the fall of Sovietism. The cribs are displayed in Krakow's main square (Rynek Glówny) on the first Thursday of December until 12pm when, after the sounding of the bugle call from the tower of St Mary's Church, they are transported to the museum in the Krzysztofory Palace for judging." For more information check out http://www.cracowcrafts.com/2.html and to see some sample szopki. Unfortunately I didn't buy a ticket that allowed me to take photos and afterwards I wish I had. After walking all morning I was able to go back to my hotel and rest for the rest of the afternoon. In the evening I attended a Chopin concert in a historic palace of sorts right on the centre square, after which I treated my self to a nice supper at a restaurant called the Orient Ekspres, whose decor was that of a train. After having travelled more than once on a train I wondered why I chose this very familiar ambiance but anyway, the food was good and the conversation of the British couples sitting across from me was somewhat entertaining. It would have been nice to have someone to converse with myself but oh well. The next morning I only had time to walk across the park and up the hill to see Wawel Castle. It was a beautiful day and although my feet were still sore from all the walking I did the day before, it was quite pleasant and the air was just slightly crisp but not too cold. I toured the big cathedral in the Castle, poked in a souvenir shop and perused the grounds without taking time to see the other exhibits. I was tempted to go and see the dragon's lair but decided I just didn't have time as I had to catch a train to get back to Katowice to meet my friend there. It had been a very pleasant couple of days in Krakow and certainly is a city I would recommend visiting and wouldn't mind visiting again. Posted by Barb at 12:31 a.m.